Click to enlarge. Map by Rani Molla. The map shows how nine western states, covering nearly a third of the country, are ineligible for Aereo. The reason for this is a federal judge’s decision in Los Angeles last December to shut down a would-be Aereo competitor at the copyright request of broadcasters. The shut-down order doesn’t cover just LA but the entire 9th Circuit (the largest of the country’s 11 court circuits). While the order doesn’t shut down Aereo directly, it effectively has that effect since the same type of technology is in play. 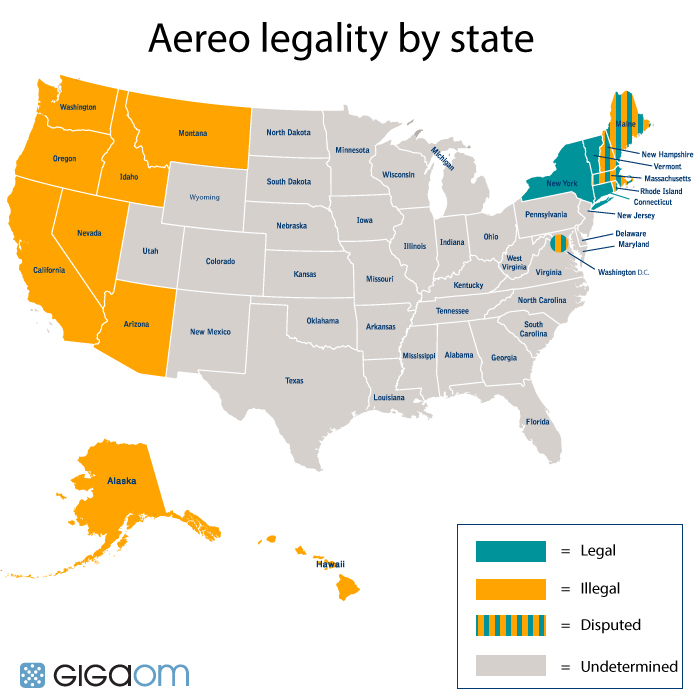 The map also highlights the Second Circuit (New York area), where an appeals court gave Aereo the green light, and two places where Aereo’s services are in jeopardy. The first is Washington, DC, where the broadcasters recently sued Aereo’s competitor, and the other is the First Circuit where broadcasters have threatened to file a lawsuit to stop Aereo in Boston. Look I don’t have a digital attena on my roof and whn I watch local channes it freezes !!!!!! I hate it.I love my soaps and have to watch it on t.v. so they can keep on making them and it is horrible the dreaded freeze!!!!! I stream the rest cause I ain’t paying car note money to see my media. Waiting and I will pay to see my soaps and not have it freeze at the good parts. How soon will Aereo be in the Atlanta Area and South Carolina? I’m not sure what’s so wonderful about Aereo. Let’s say it succeeds and destroys the income stream that the local broadcasters get from the cable companies. Well, they won’t be able to compete against the cable networks that will continue to get fees. The local’s programming is already pretty marginal and it will just get even more marginal. I seems like it’s just a bomb designed to destroy free broadcast content. I live in greater Boston, and without the DVR feature I doubt I would have tried Aereo, but I am trying it and Aereo really is wonderful. Whatever rough spots it may have had at the start in New York, the Boston roll-out is very impressive, at least it is over Verizon FiOS.